Artist Victoria Hart has created a wonderful image of a mother hen and her baby chick(s), just in time for Mother's Day AND International Respect For Chickens Day! 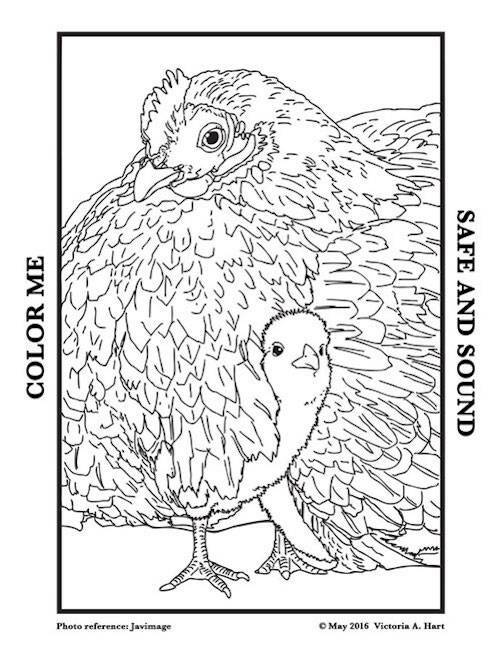 Just click on the image below for a printable PDF that kids (and adults) can use for coloring. United Poultry Concerns urges activists to plan an action for chickens in honor of International Respect for Chickens Day in May. Write a letter to your local newspaper, set up a library display, leaflet at a busy street corner – do something positive! Chickens come from the tropical rainforests of Southeast Asia. Perched in the trees and sensitive to infrared light, chickens see the sun an hour before humans do. Despite domestication and genetic modifications, chickens are essentially the same as their wild relatives, the Red Jungle Fowl. In nature, the hen and rooster find and create a ground nest together. They try out secluded places before settling on the site they both like. Embryonic chicks communicate with the mother hen and each other from inside the egg. The mother hen turns each egg 30 or more times a day in response to cues from the chick embryo. The mother hen helps her chicks break out of their shells. Roosters protect their families. Hens and roosters will fight to the death to protect their chicks from predators. Roosters are foragers and family men who seldom fight in their natural habitats. Chickens love bamboo seeds and figs.